In addition to placing ourselves in the latitude of the Holy Land, we also need to make one other point of reference change, and that is we need to go back in time about 2000 years to when the New Testament was written. This is important because the position of the sun relative to the stars has changed somewhat during the past 2000 years due to the earth's precession. The earth is like a big spinning top or gyroscope. If you spin a gyroscope and hold it on the tip of your finger you'll notice the axis of spin changes slowly over time making a small circle. You'll notice the same thing if you spin a top on the floor—the axis of spin changes slowly over time making a small circle. The only difference is the earth isn't suspended by a finger, nor is the earth spinning on a floor. There is no cosmic force of gravity "downwards" towards the South pole. The force of gravity is actually sunwards, towards the sun, and moonwards, towards the moon which is constantly orbiting the earth. It is these two forces which cause the slow precession of the earth. The second difference is 2000 years ago the sun was entering Capricorn on December 22, whereas today the sun doesn't arrive at that position until January 18, almost a month later. 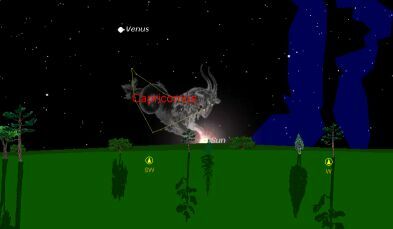 In the illustration here the sun has just set and the stars have just come out, and we can see that the sun is positioned on the front leg of the constellation Capricorn. 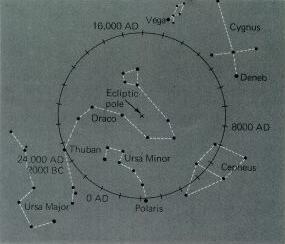 This is where the sun was relative to the stars on December 22 around the year A.D. 1. In our present age you have to wait until January 18 to see this. To summarise, we need to go back in time about 2000 years, and we need to position ourselves at a latitude of around 25-50 degrees North so we are both at the time and the place when and where the New Testament was written. From here on out my discussion will be from the point of view.